So now that I'm moving out of the homestay and am finished with my first semester, it's time to get cracking on what's really important, cars. 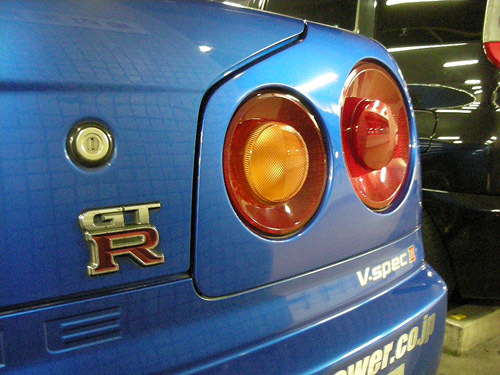 This post is the first part of a many part series explaining the process of getting a car in Japan start to finish as I myself experience it. 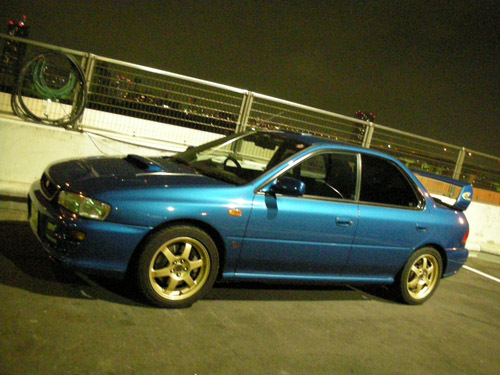 So you've just moved to Japan and you want a car, what do you do? Well there is alot to consider, both in car choice and paperwork involved. First thing before all of that if you need to be eligible to buy a car. You can't just go hand some guy cash and start driving like in California, it's very strict and a long process, especially if you're a foreigner. 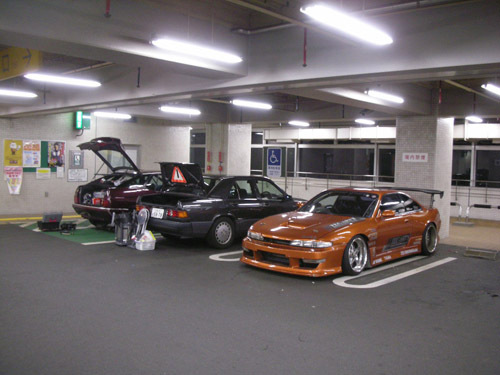 To own a car you need a Japanese Drivers License, A registered parking spot in your name to prove you have a place to put it, and means to pay Shaken registration for the car you're planning to buy, and that's all before you even start shopping. That's all well and good but let's start with one thing at a time. Before you can do anything you need a Japanese Drivers License. Now before you start thinking, "Ha Ha I have the 1 year international driver permit from AAA I'm ok." sorry no you're quite wrong. The Japanese disagree and the AAA International Driver's permit is only valid for 3 months upon entering the country, sorry. You might be able to get away with renting a car but certainly not buying one. If you intend to own a car in the country they expect you to show commitment by at least going through the process to transfer your license over. Ok, so how do you do that? Well, before leaving the US, go to the DMV and request a Driver's License history report that shows the date of issuance and that the license is still valid. If you didn't do this you get to go through a 1-2 month hell with the DMV like I did. Next step is to take that piece of paper and your US Driver's License to JAF (Japanese Automobile Federation, the J-version of AAA) and have your License officially translated into Japanese for a slick 3,000yen fee. They'll take a look at the DMV paper and also note on the translation your issuance date and that it's valid. With your new translated papers you can go take the tests at your city ward's DMV to start the transfer process. Sounds easy right? Wrong. There are 3 tests required of a US National in order to get his/her License. First an eye test (easy). Next is a 10 question written test similar to the written test in the states. You read a small 20 page pamphlet and you'll pass fine. Be happy cause the written test is gobs harder for the Japanese citizens. The last thing to do is take a driving test on a closed course. This is where it gets hard, the test is so strict and so difficult where you can't make a single mistake, that the average fail rate before passing is 3 or 4 times. A way to really add to your chances of passing if get some real practice on Japanese streets and memorize the order in which you have to do things for the test. This is where this post comes in. Driving Practice. I've been driving with Neal in his Laurel through the streets from time to time to try to get comftorable with driving in Japan. In my last days before leaving my homestay, we went out for some more practice. I made a video of our experience so check it out! 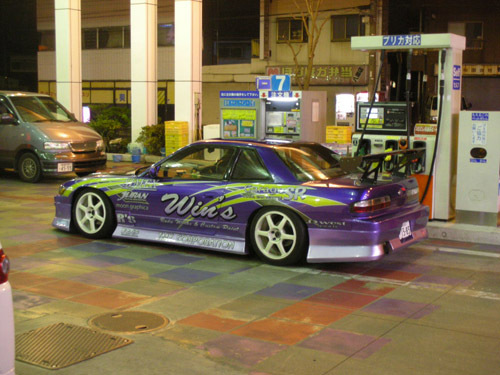 We did some short driving practice around Soka and Yashio before heading out to the freeway. After a humorous gas fill-up, we were well on our way. We did the usual runs we do on the C1 and Rainbow bridge. I got a chance to really get a feel for what it's like on the Japanese freeways and really got to feel comftorable with the environment. 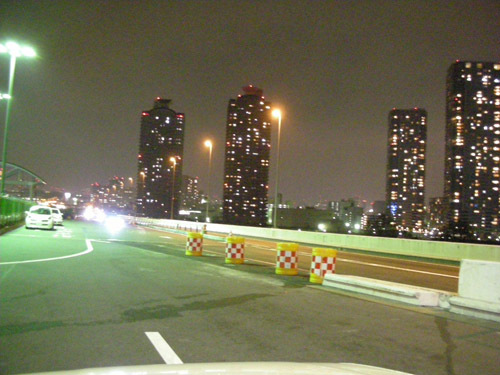 Here is a view of the city from the Tetsumi parking area. 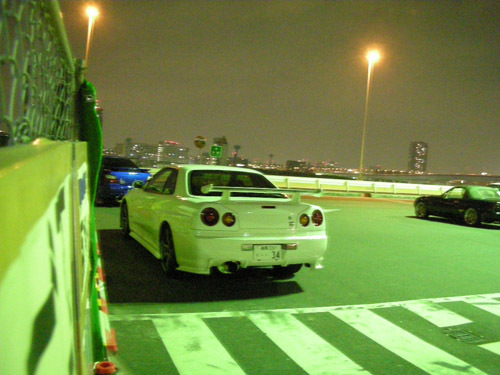 There are several parking hang out spots throughout the Tokyo freeways, Daikokufuto being the most famous and popular. Tetsumi is smaller and always our first stop on a run of the freeways. Very zesty STI just hanging out. While driving we met up with Masa who followed us to Tetsumi to hang out. 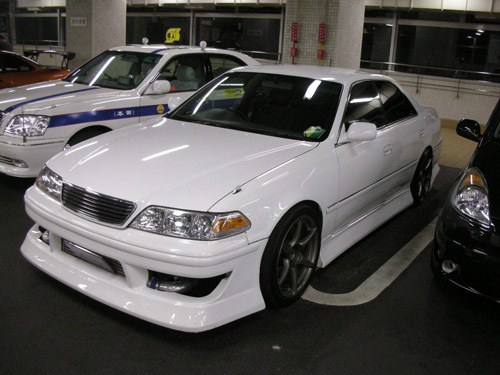 Another friend of Masa's with the Aristo met with us as well. His car has curtains in it...like a house. It's part of the whole VIP style thing. 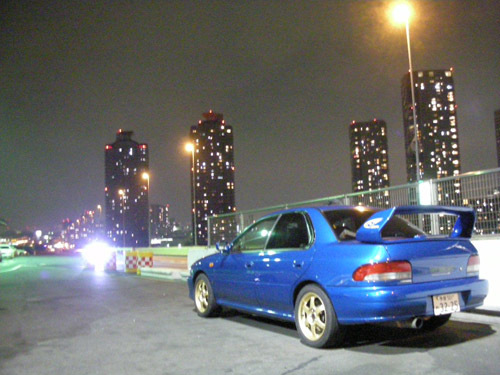 You should know by now my car posts are dominated with Skylines. 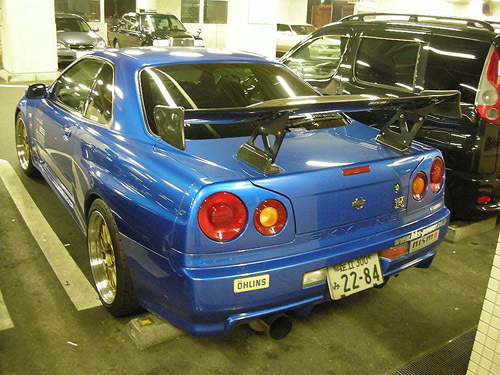 After awhile we moved from Tetsumi to a new parking garage area to meet with the blue R34 guy who I talked with on one of my first nights out. He saw his car in the video and on the site and wanted to talk to me again so I met up with him here. Masa's car and some other people. 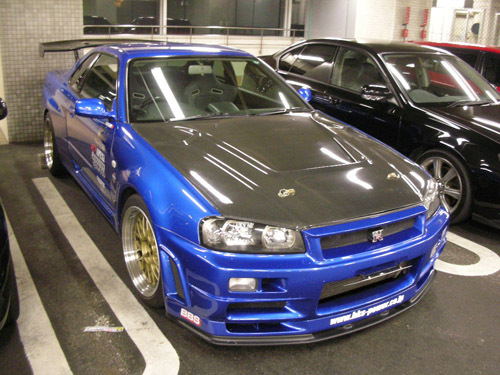 The blue R34 making me cry with its pure beauty. You can see the group chatting away in the background. 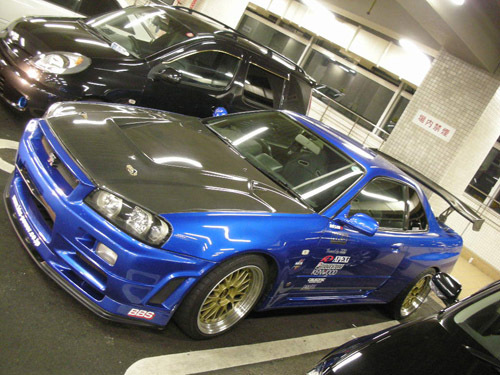 This was a friend of the R34 guy, very zesty as well. In order to make it home to start the move to the new place the next day, I had to leave earlier then I woudl've liked. I got alot of practice in though and I think after one or two more outings I should be ready for the actual driving test. SNAP parking garage?!?! Did you guys drift in there?! Hey i saw Tokyo drift, Is it kinda like that there? Grate pics mason, was it as cold this time ? Your Livin' the Life! Things I wish I would have done while at TUJ!